This recipe makes a large, rich cake that’s moist and full of chocolaty goodness. 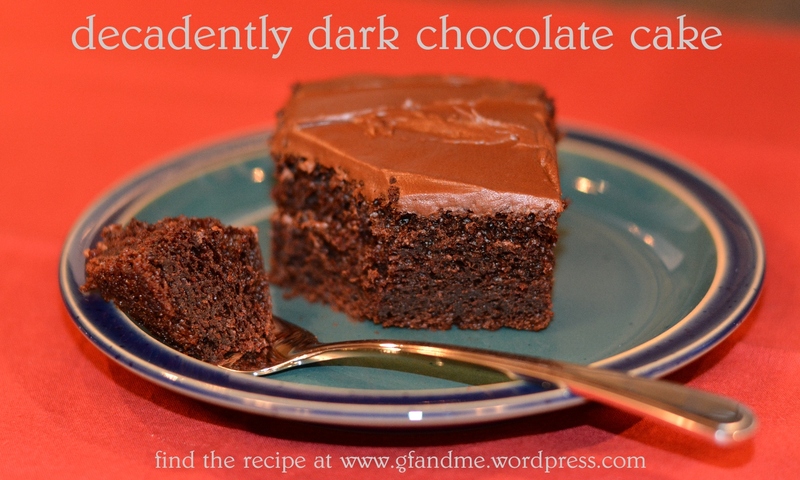 Great with chocolate icing for a double chocolate hit but we also recommend eating it naked (the cake, that is) or with a scoop of vanilla ice cream. Baked as a round layer cake, it’s also great for birthdays! TIP: If you like mocha, top your cake with coffee whip. Recipe included below. NOTE: We posted this recipe early on when we started this blog and wanted to repeat it for our new followers. Apologies to those of you who have already seen it. Preheat oven to 350 degrees and lightly grease a 9 x 13 pan. In large bowl, sift together first seven ingredients. Make a well in the dry ingredients and add the milk, oil, eggs, and vanilla. Beat together for two minutes. Stir in the boiling water. The batter will be very soupy. Pour into your pan and bake for 35 to 45 minutes or until a toothpick comes out clean. Let cool and frost with your own icing or with Duncan Hines Creamy Homestyle Icing (labelled gluten free at the time of posting). TIP: If you like mocha, try this: Grind a spoonful of instant coffee into powder and mix into a small container of cool whip. Let the whipped topping sit for a few minutes to dissolve the coffee powder, then stir it, and use the coffee whip to ice your cake. Tastes great! Not in the mood for an entire cake, try gf and me’s cake in a mug. Or if you happen to be all out of flour, try our Sinful Chocolate Mousse Cake — no flour required. For an even more decadent treat, add a scoop of homemade ice cream! This entry was posted in Baking, Recipes, Uncategorized and tagged birthday cake, bob's red mill gluten free flour, celiac, chocolate cake, cloud 9 flour, GF, gluten free, gluten free in Red Deer, recipe. Bookmark the permalink. That looks so good! Icing zaps my blood sugar so I prefer my cake naked. Thanks. You can also eat more for the same amount of calories when there’s no icing! Thanks! It is good – a conversion of a pre-celiac cake. You’re welcome and I agree! Thanks so much for the link from your blog. Glad you enjoyed the cake. It is an old family recipe on my dad’s side that really works well with the gf flours. I think it’s because of the hot water. Hope you find your missing cup! Looks delicious, I’ve never used Xanthan gum what is it used for. Xanthan gum is used to replace gluten and hold everything together. It’s like guar gum. Without one or the other your gf cakes and cookies etc will just crumble. You can purchase it at any well stocked store where you buy gluten free items.